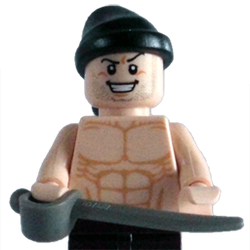 Other than the sails and rigging, the model is entirely LEGO and comprises of some 4500 bricks and 14 mini figures. 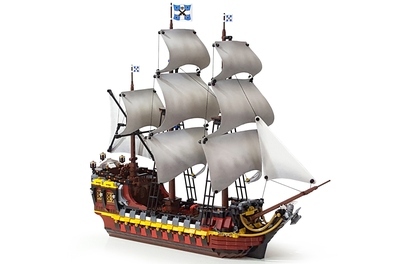 The inspiration for the build came from a desire to have a LEGO galleon that looked as good on display as a model galleon, whilst rivalling the largest official sets in size and piece count. The display base is comprised of a further 1000 parts, which are mostly tiles, small clear plates and studs for the water effects. Without the water effects, the display base is less than 150 parts. Though designed as a collector’s model, the Crow is also a 'playable' build and features 22 shooting guns! 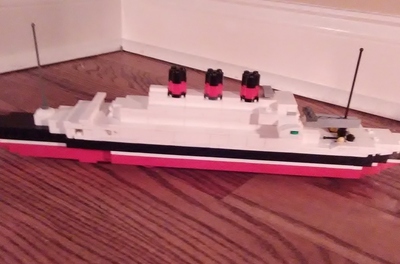 She also has a modular design that allows separation of the decks and access to the minifig play areas. The Captain's cabin has an organ, treasure chest and bed. The dining cabin has table and chairs. The crew quarters has crew bunks. The main gun deck has space for 14 wheeled cannons. The galley has a fireplace, bench, utensils and foodstuffs. And the brig has a rat! There is also a large amidships (with cannons and an opening below decks hatch), as well as a removable quarter deck for access to the cannons underneath. 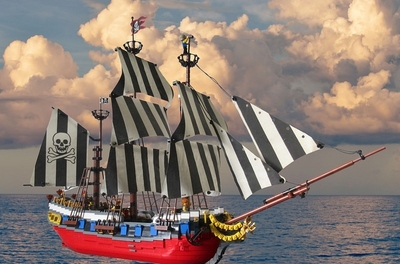 I hope you enjoy the photos of this build and would like an official LEGO set of an accurate galleon model, so that the Crow may have fair winds and following seas in the ocean of LEGO ideas.